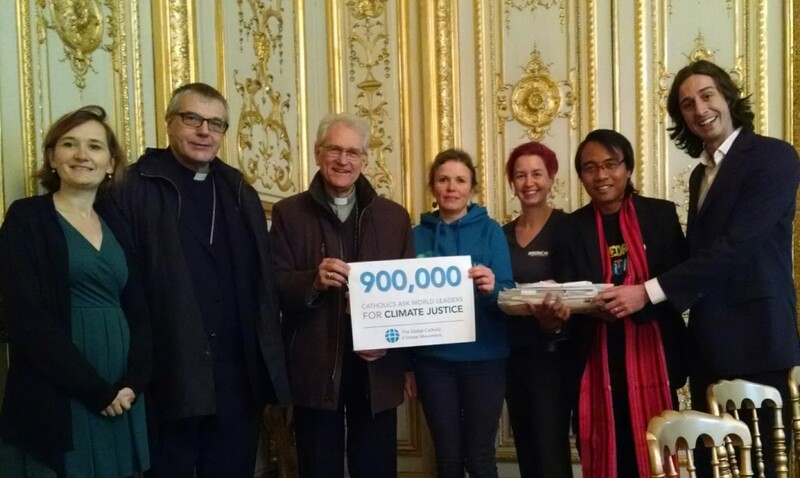 We met President Hollande to demand Climate Justice! 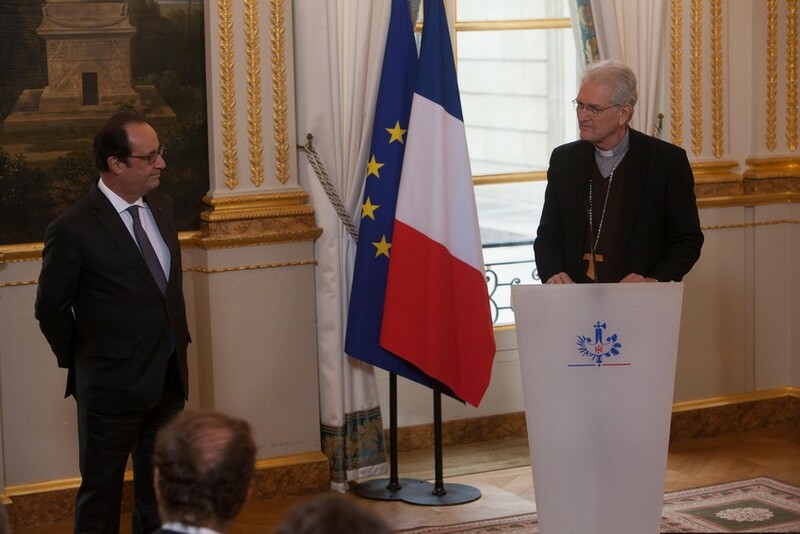 December 10, Paris – Today we met the French president, François Hollande, to deliver the 900,000 signatures of our Catholic Climate Petition in coalition with other faith groups. This was a follow up of the November 28 interfaith event with Christiana Figueres, who is the United Nations climate chief. Collectively, we delivered a total of 1,833,973 signatures. An impressive amount of faithful demanding Climate Justice! 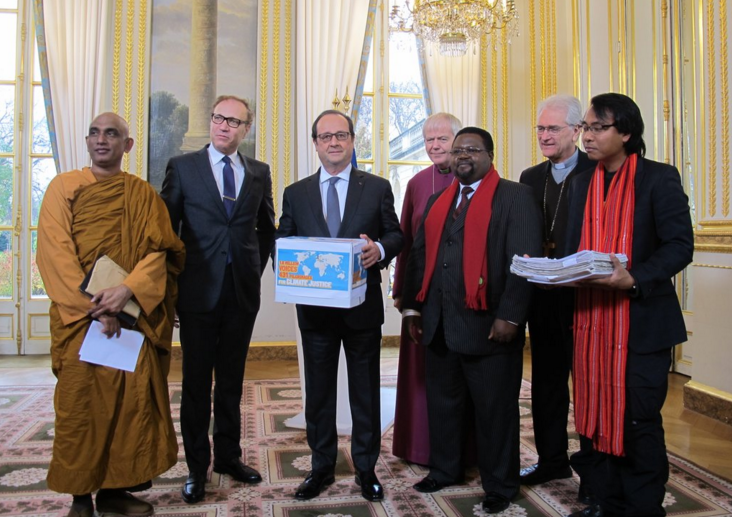 President Hollande holds the box symbolizing the 1.8 million signatures. The two GCCM representatives are on the right: Msgr Steiner (from Brazil) and Yeb Saño (from the Philippines, who holds a pile of thousands of Catholic Filipino signatures of our GCCM petition; he represented the climate pilgrimages). The French government presides the COP21 Climate Summit, so by delivering these petition signatures to president Hollande we made our voices heard by the highest political authority of the climate negotiations. 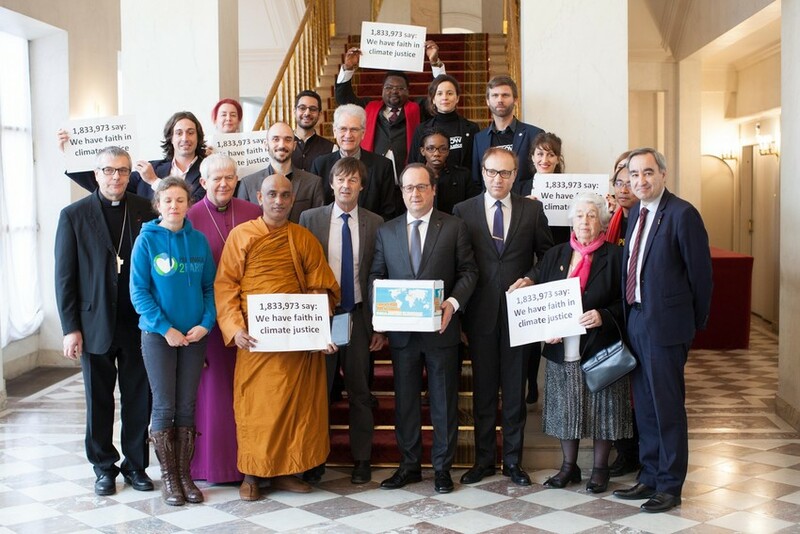 We met Hollande in the Elysee Palace, represented by prominent faith leaders from the four faith-based networks that collaborated in this campaign: our GCCM movement, the ACT Alliance (coalition of Protestant groups), Religions for Peace and Our Voices. 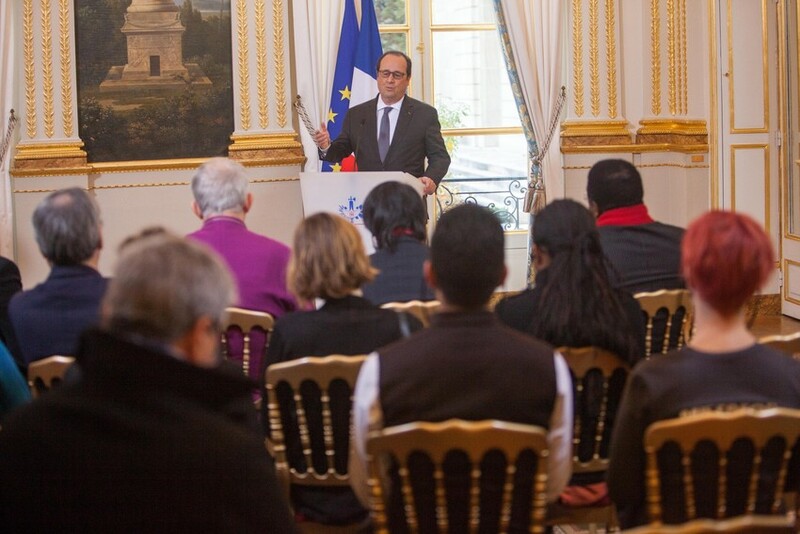 President Hollande addresses the interfaith delegation. Credit: Sean Hawkey/WCC. Msgr. Leonardo Steiner, Secretary General of the Catholic Bishops Conference of Brazil, speaks on behalf of GCCM. Credit: Sean Hawkey/WCC. 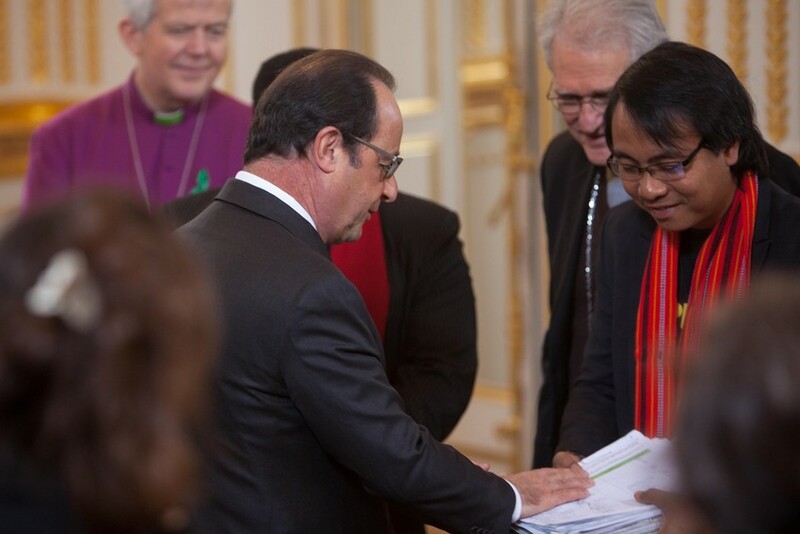 Yeb Saño shows the Catholic Climate Petition signatures from the Philippines to President Hollande. Credit: Sean Hawkey/WCC. We were blessed to be joined by Yeb Saño, the former Filipino climate negotiator that gained world prominence in 2013 when he broke into tears in the UN climate negotiations asking for urgent climate action. Yeb recently led the People’s Pilgrimage from the Vatican to Paris, and has been an active GCCM member promoting our petition in the Philippines. He brought with him a pile of petition sheets with over 30,000 Filipino signatures, to illustrate the immense amount of faithful that demand climate justice. 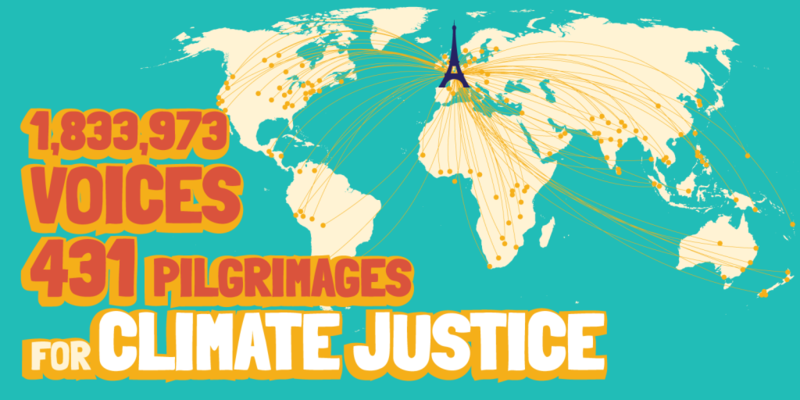 “As a way to express faith communities’ deep sense of urgency regarding the climate crisis, we embarked on pilgrimages from all over the world and many pilgrims walked to Paris from different countries, spreading hope for the future of humanity and hope for COP21, carrying the message of climate justice and our solidarity as one human family”, said Yeb. The GCCM delegation represented the 900,000 Catholics who signed the petition. From left to right: Estelle Grennon (French Bishops Conference), Mgr Brunin (Bishop of Le Havre), Mgr Steiner (Secretary General of Brazil Bishops Conference), Judith Tooth (CAFOD), Kathrin Shroeder (Misereor), Yeb Saño (People’s Pilgrimage), and Tomás Insua (GCCM coordinator). This was the epilogue of our COP21 petition campaign, an amazing mobilization effort through which we collected 900,000 signatures in 7 months (the campaign will continue in 2016, for Catholics to put pressure on national and subnational governments). Catholic communities, parishes, schools, youth groups, families, have mobilized as never before for climate justice (see pictures from the campaign around the world). This was a powerful message from the grassroots, making clear that the Catholic community stands with Pope Francis asking for bold action to tackle the climate crisis. The interfaith delegation with President Hollande. Credit: Sean Hawkey/WCC. For more pictures, see album of the event. With about 24 hours left before the COP21 officially ends, let’s pray to deliver a fair and transformative agreement that can advance the climate justice we demand. Today truly was a beautiful testimony about how humanity can come together to overcome the challenges we face. Let’s pray for for governments to unite and collaborate as faith communities did this morning. Let’s #pray4cop21. Thanks for being part of our movement! You can also watch the video-recording of the event.